Oak Mountain Winery is hosting their annual Cinco de Mayo Fiesta in their Barrel Room. Exciting Mexican spirit fills the air as the guests are greeted with festive beads and tantalizing drinks. Everybody mingles while enjoying delicious appetizers. The celebration kicks off with a fun party atmosphere, but it becomes apparent that some guests don’t get along and others are hiding scandalous secrets. The party forges on with a delicious Mexican dinner while the guests enjoy a fun time. The party-goers gossip and laugh, and to everyone’s horror, a dead body is discovered! The guests will rally together and undergo a thorough investigation including a fiber analysis provided by the local police department. Taking short breaks to relieve the stress of the investigation, they will engage in more exciting revelations. They take turns accusing the suspects they believe are guilty, and everyone comes clean with their involvement in the crime. Backed into a corner, will the murderer confess? It will be a fiesta that the guests will remember forever! 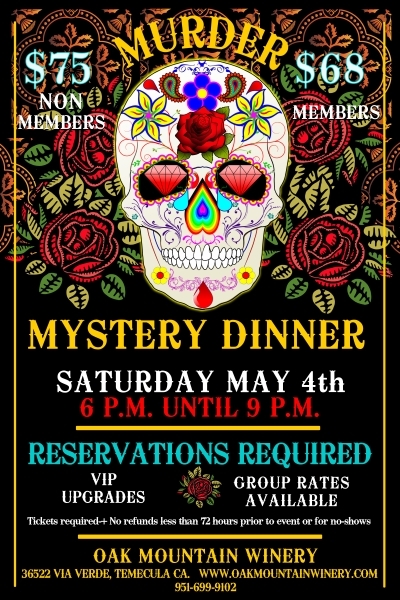 Includes Four Course Dinner & Interactive Murder Mystery. Access to our Exclusive Cave Member lounge, where you’ll enjoy a delicious glass of wine delivered to you by your VIP host. Mingle with the actors of our Murder Mystery dinner and pose for photos. Beer, wine, brandy and champagne cocktails will be available for purchase! Braised beef cheeks, classic dark mole sauce, charred spring onion, white corn churros.